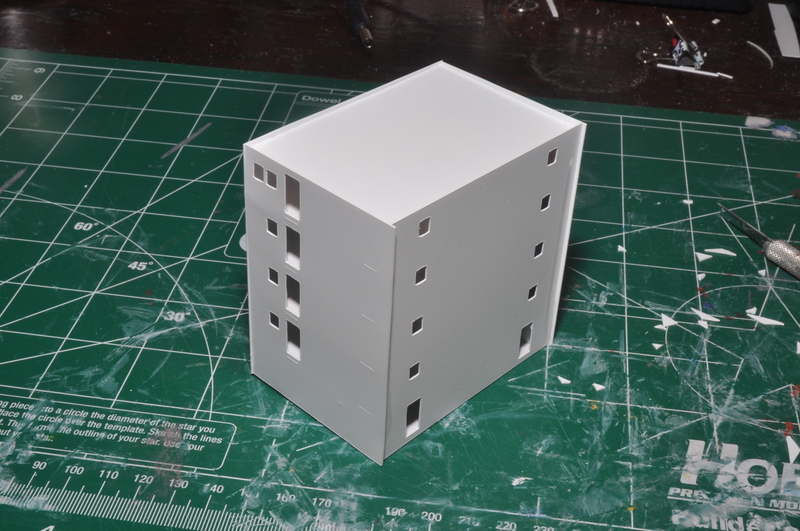 These are instructions to build the house, or superstructure, of the modern 375′ container ship. All the houses of my ships are built in a similar manner: deck by deck, with vertical reinforcing spacers, or inner walls. 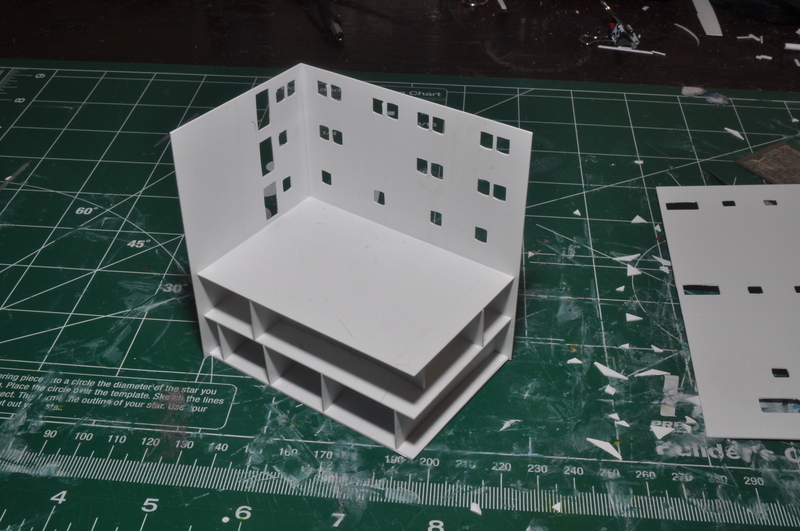 The four outer surfaces of the main block are slightly taller than needed; the two sides are also slightly wider. These extra lengths give some margin of error, and can be trimmed with a sharp knife or sanded off once the block is completed. The spacers in this house are cut to the length of the decks. Be careful that they do not interfere with doors and windows. As shown, the spacers can be used in many orientations. I vary the orientation to prevent a clear view through the house. 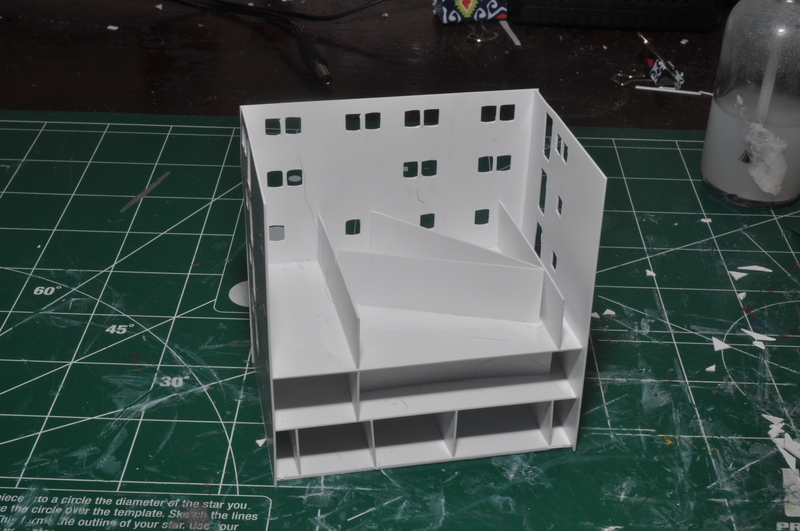 This model was built without acetate for window glazing, as this model used Krystal Klear instead. When using acetate, trim it close to the windows so that it will not interfere with the spacers. There are sufficient spacers to build a complete interior if desired. 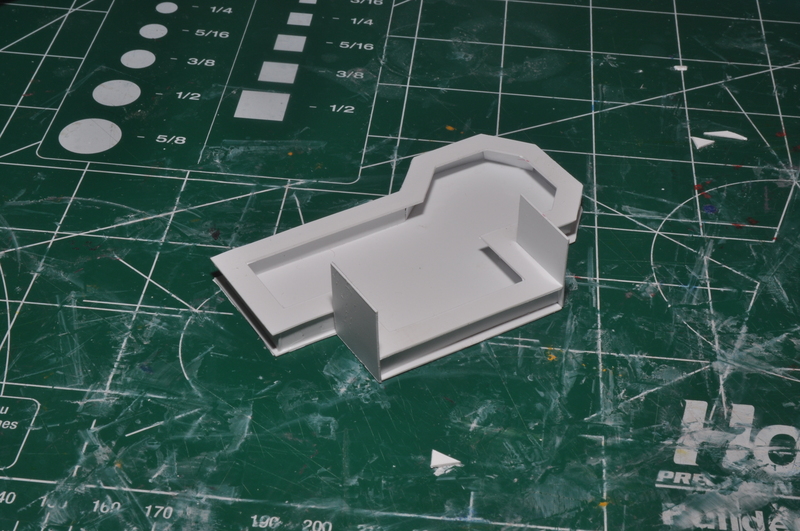 Styrene sometimes has flash on the edges, even with a through cut. Swiping all edges quickly with a fine sandpaper stick will remove flash and help eliminate uneven joints. Doors can be closed, open, or slightly open. Doors on a ship are generally hinged on the bow side. There are eight cuts for the deck: one is slightly larger and is the roof; set this aside. Start by laminating two decks together for the base, to provide a better gluing surface for the front and sides. Make sure all four sides are oriented correctly! 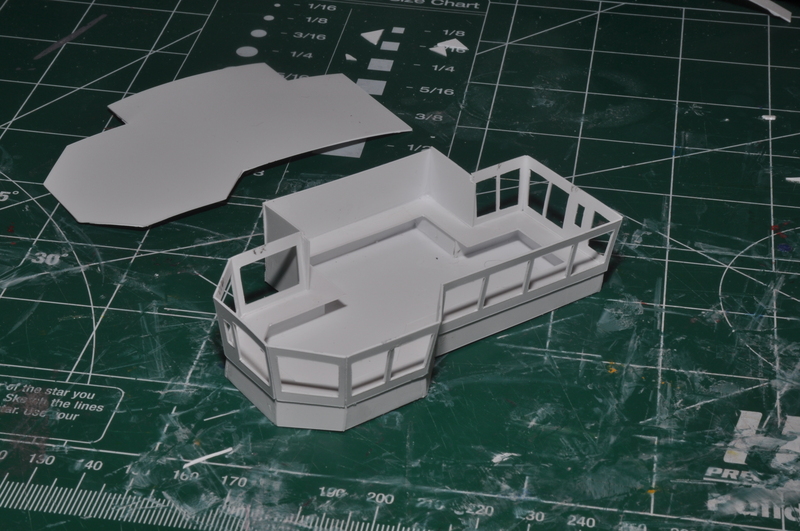 There are slight marks on the sides that denote the outside and where exterior decking will be glued. 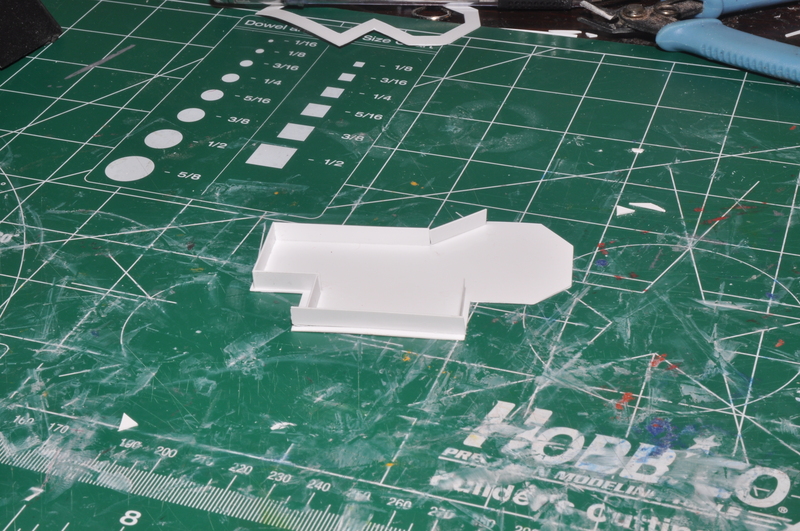 Glue the front to the base, with both ends overlapping the base by an equal amount. Use the spacers as shown to keep the front vertical. 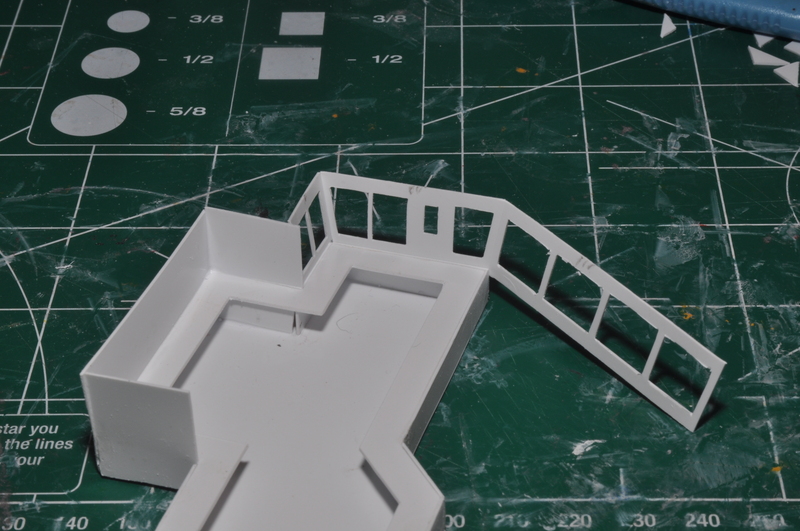 Glue the second floor to the spacers and front wall, keeping the overlap on both ends equal. 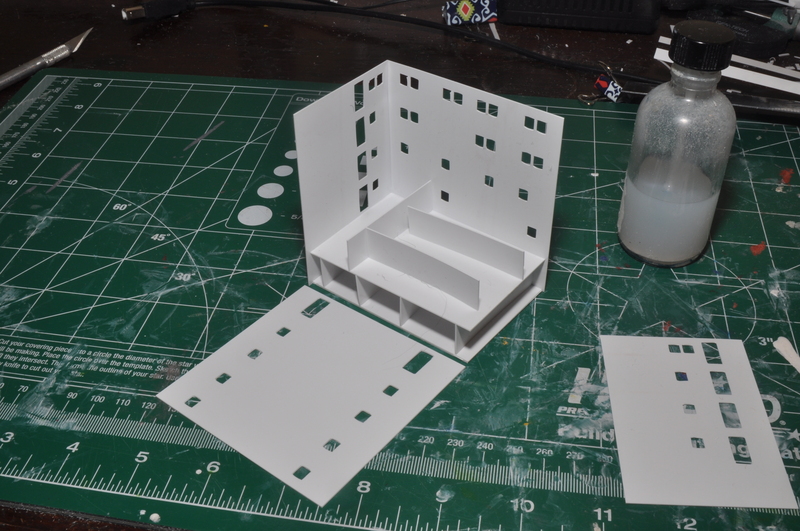 Let dry for a while, then glue one side to the base, second deck, and front (along the edge). Note the the side is slightly wider than needed. Glue spacers for the next floor. 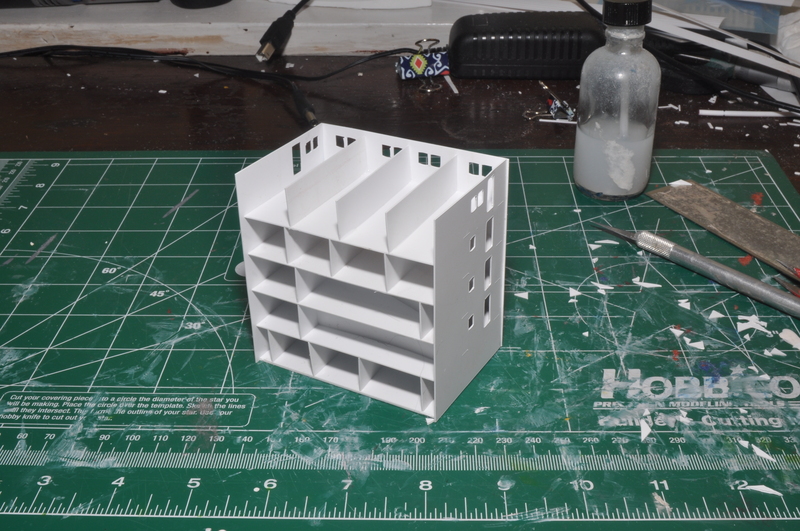 Notice that I just varied the orientation:you just need enough spacers so that the next deck will be stable. Also note the side shown is incorrect: I was making some custom modifications on this house and flipped the doors and windows. 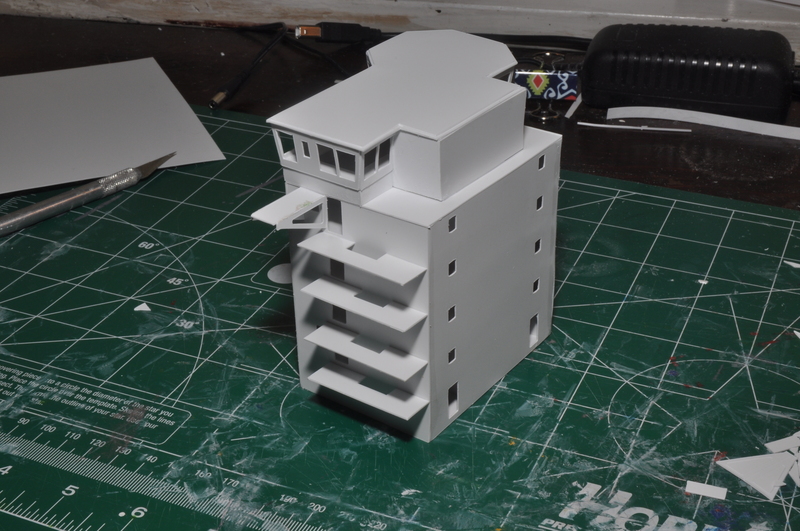 Here I have glued the third deck in place. Hint: the doors may be loose in the door frames. Here you can use a strip of acetate across the door at its window height to help you align the doors. Here’s another way to use the spacers. This is about the right height to add the second side. The “mistake” on this side? None is apparent, but the arrangement won’t line up correctly with the bridge still three decks up..
Now we are near the top of the block. Additional spacers could be added to block views. Glue the back on. Here you will notice the overhands prominent along the back edges, at the top, and slight at the front edges. Trim these edges with a sharp knife, or use sandpaper to smooth them down. The are four multi-sided horizontal pieces: the base and desk level, which are the same size, and then an inner and outer roof (the outer roof is larger) There are also three sets of strips: one full height, and two partial height. Use the thinnest of the strips to line the base, slightly inside the perimeter. 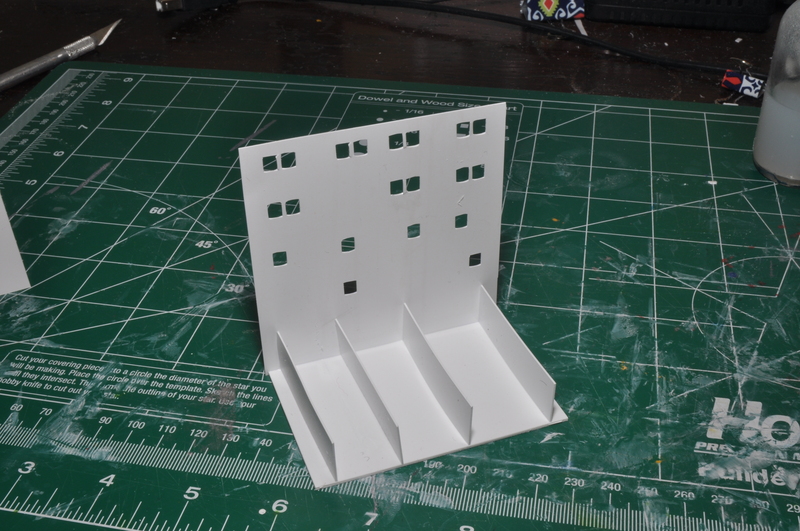 Glue the desk level piece on top of the strips, making sure this level is completely aligned with the base. A small square will help checking the alignment. Measure and cut two parts from the full height strip. Use a chopper or small square and make sure the parts do not protrude past the rear edge. Cut the rear piece and glue in place. I leave it a little long and trim it later. Start covering the perimeter with the wider of the partial height strips. I glue alternate strips as shown. When dry, I use a sanding stick to trim off the excess and bevel the sides. Here I’ve glued the remaining strips. I’ll let them dry and sand them down. 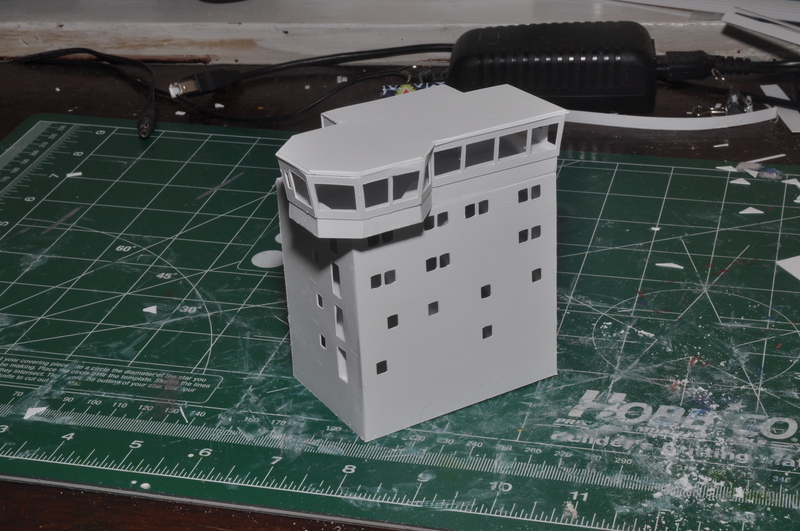 We now have a base for the all-window bridge. Orient the bridge windows. I proceed clockwise, separating the first three sections from the rest. 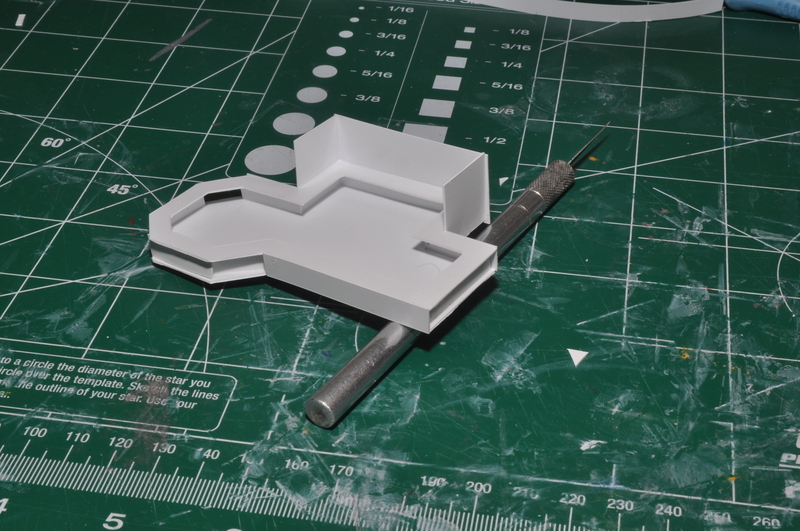 The pieces are sized to glue to the outside of the perimeter strips. 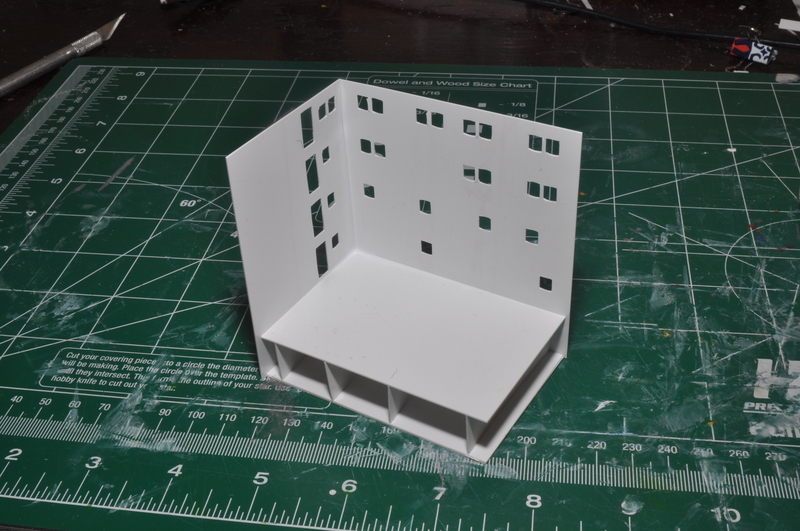 For the first section, which slants rearward, align the top edge with the short no-window wall. Note how much space there is between the desk and the bottom of the window. Maintaining this spacing all the way around is critical for the build. The next sections wrap around, starting at the one “reverse” break. 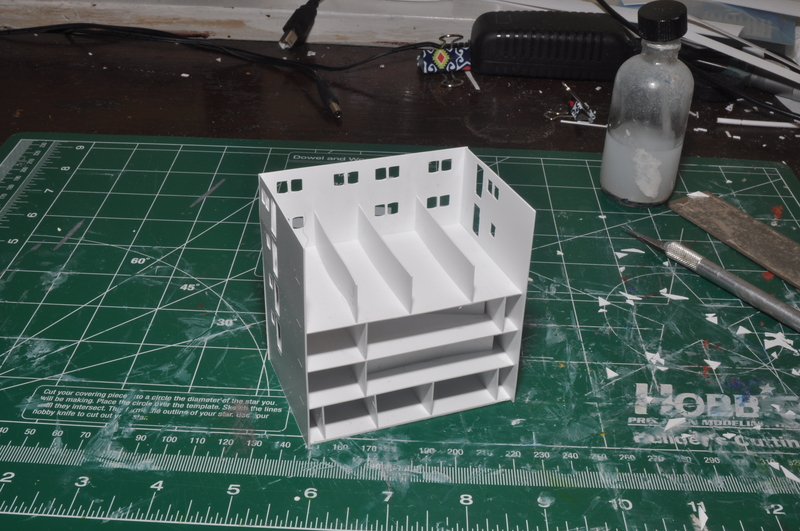 The structure is a little flimsy at this point, which is desirable. 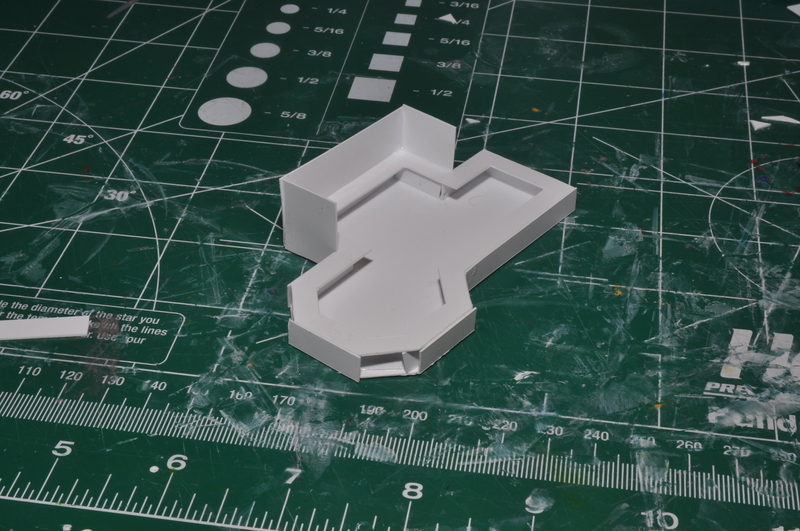 You must clip out a small notch on the two short no-window pieces at the inside top so that the inner roof will fit. 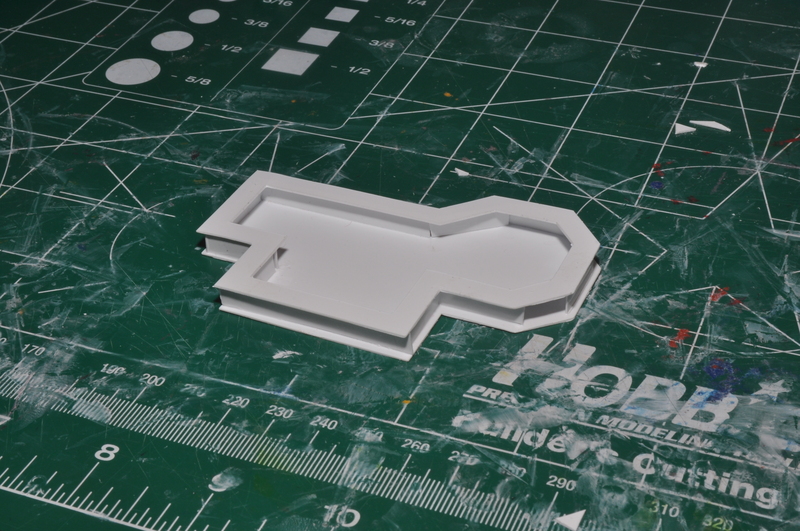 You could alternately cut out two small notches from the inner roof. I had a camera failure here. Laminate the inner roof to the outer roof, making sure the orientation is correct. 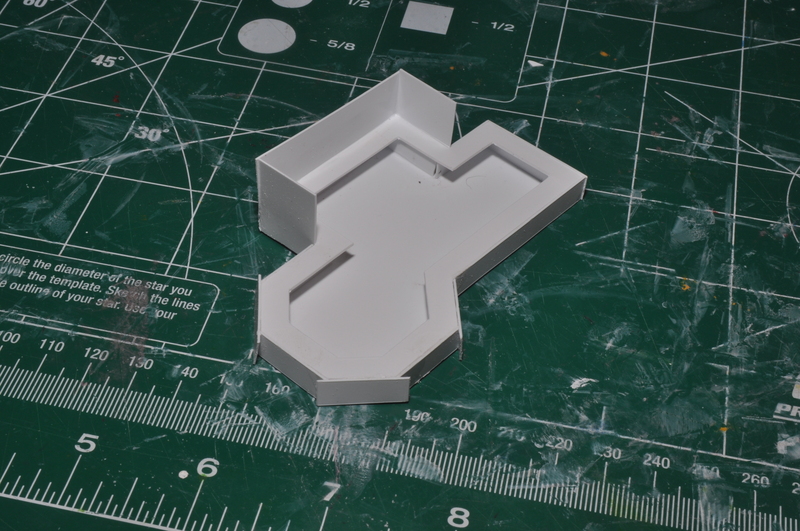 Gently fit the assembled roof to the structure, starting with the back edge. It may take a little wiggling and coaxing, but the roof should slide into place, with the outer roof on top of the sides. I again worked clockwise. The reverse bend section needs the most attention, and the inner roof may need to be trimmed slightly back. When you are satisfied with the fit, begin gluing at the rear edge. The bridge mates with the core, with the port side front as the key alignment point. Due to an error, I had to remove the starboard side of the core, because the bridge door and wing extension did not align. It gave me a good opportunity to show the interior of the core. Because it is broken up, it needs no painting. 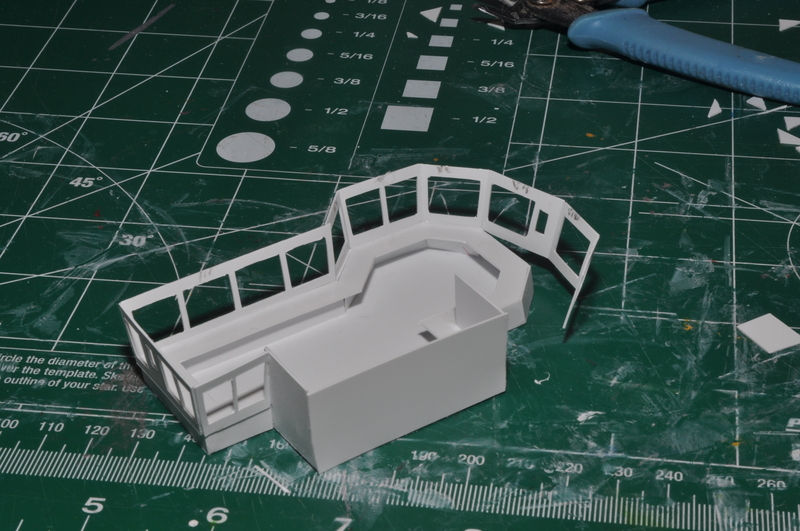 Here I’ve added the starboard exterior decks, which are aligned by small scored lines on the core, and the bridge wing.